Mercedes-Benz G-Class to get twin-turbo V12 AMG version? If you think the Porsche 911 is the champ at incremental revisions through successive generations, then you should have a look at the Mercedes-Benz Gel&auml;ndewagen, whose features change on a scale of geologic, not automotive time. We've had a peek at the 2013 G-Class and its new LEDs and mirrors, and at a camouflaged AMG version on test. That AMG, however, will be getting more than new trimmings when it arrives later this year: the twin turbo, 6.0-liter V12 from the SL65 AMG will be tucked under its bonnet. It's the first time the G-Class has gone with a dozen cylinders. Since the G55 never got the 6.2-liter naturally-aspirated AMG engine, and so never switched to the G63 name, this could mean that it will stick with the same model name now that it's getting the twin turbo, 5.5-liter V8 with 536 horsepower. 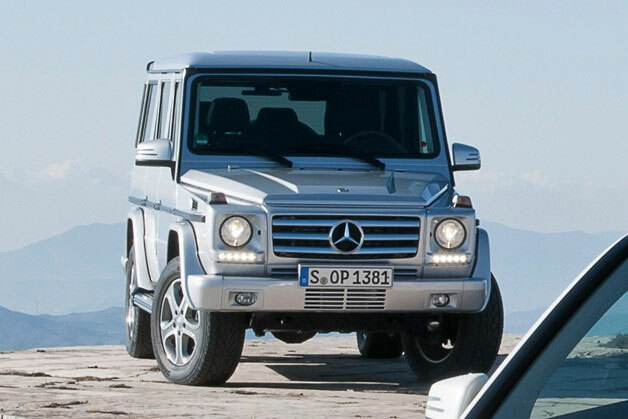 However, Autocar indicates the name will be changed to G63. That would leave a little less branding daylight between it and the G65, but the power should convince: the bigger boy will have 621 horsepower and 737 pound-feet to work with, mojo enough to move it as fast a Bentley Mulsanne from a stoplight to 60 mph. Both it and the G55 will also get the 7G-Tronic transmission, while the G63 will add stop/start and brake energy recapture.Mercedes-Benz G-Class to get twin-turbo V12 AMG version? originally appeared on Autoblog on Wed, 28 Mar 2012 10:00:00 EST. Please see our terms for use of feeds.